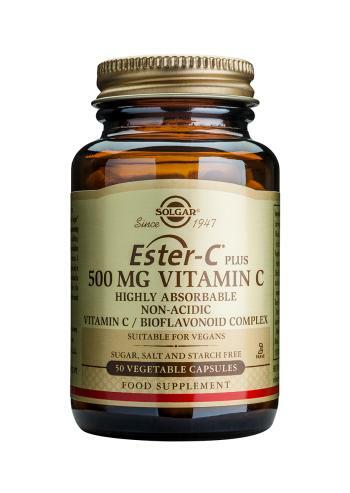 Solgar Ester-C Plus 500mg is specially designed to be highly absorbable, non-acidic vitamin C with bioflavoids and so, kind on the stomach. Ester-C Plus is exclusively formulated for Solgar and provides a patented method of supplementing pH neutral (non-acidic) vitamin C to prevent digestive irritation. In addition, Ester-C Plus contains the vitamin C metabolites that occur along with vitamin C in nature. These metabolites - L-threonic acid, L-lyxonic acid and L-xylonic acid - have been shown to enhance the absorption of vitamin C.
A special manufacturing process is employed to form a unique calcium ascorbate metabolite complex. Solgar's Ester-C Plus offers the additional benefits of providing acerola, citrus bioflavonoid complex, rutin and rose hips in the Ester C ascorbate metabolite complex. As a food supplements for adults, one (1) to three (3) vegicaps daily, preferably at mealtime, or as directed by a healthcare practitioner. Encapsulated with these natural ingredients: vegetable powdered cellulose, magnesium stearate, silica. Vegicap capsule shell: vegetable cellulose, glycerin and water. Solgar's Ester-C Plus is suitable for vegetarians and vegans. Sugar, salt and starch free. Vitamin C's primary function is to help maintain collagen, a protein necessary for forming skin, ligaments, bones and teeth and for helping to maintain the strength of blood vessel walls. High levels of vitamin C are also essential for the metabolism of white blood cells, which are critical components of the immune system. In addition, vitamin C plays an important role in the absorption of iron, which is necessary for the formation of red blood cells and in the utilization of folic acid, one of the B-complex vitamins.